Who says a dental visit must be horrible and painful? Painless dentistry is Dr. Alexander’s mission. With a gentle touch and true concern for our patients’ comfort, Dr. Alexander makes his patients’ experiences relaxing. 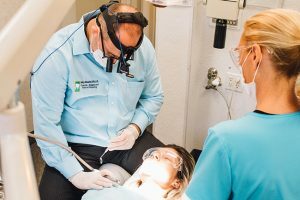 Dr. Alexander goes to great lengths to invest in dental techniques, products, and equipment that ensure comfortable appointment(s). In our initial visit, we take the time to discuss how we can most comfortably help our patients. We treat all our patients as special individuals and know that everyone has a slightly different preferred method to maintain comfort. Dental injections (i.e. shots) are notoriously the most feared part of dental procedures. We take this into consideration and have combined many dental techniques to perform a virtually painless injection. Different studies show different techniques to give a painless injection. Since each patient is unique, we combine these different methods and use what we would describe as a “staged approach”. This includes using a very strong Novocain gel for 2-4 minutes. We then gently and slowly place just a few drops of a lesser acidic, “gentle Novocain”, and allow it to take effect for 2 minutes. The area is comfortably numb at this point so that no pain is felt throughout the area being identified. Then, we follow up with a slightly “stronger Novocain”, which is also a very gentle, slow delivery. We also use a vibration technique while delivering the Novocain. This is proven to trick our brain into not feeling the injection by interfering with pain signaling to the brain (Gate Control Theory of Pain).